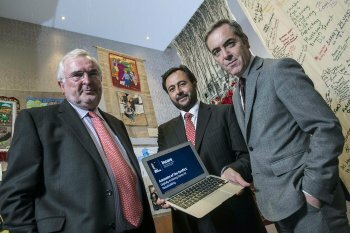 Ulster University Chancellor Dr James Nesbitt today launched a permanent digital archiving project that will preserve personal accounts of the conflict in Northern Ireland for future generations. The Accounts of the Conflict Archive has been developed by INCORE, the International Conflict Research Institute at Ulster University, is funded by the European Union's PEACE III programme and is managed by the Special EU Programmes body. It provides a publicly accessible digital cross section of audio, audio-visual and text formatted stories and testimonies of the Northern Ireland conflict. The accounts have been sourced from previous and current story gathering projects. The new resource was unveiled by the Chancellor as part of a special two-day international conference organised by INCORE where global academics and practitioners gathered to explore the role of digitally archiving stories for peacebuilding. Speaking at the launch, the Chancellor heralded the Ulster UniversityINCORE project as one of the many approaches to dealing with the legacy of the past: “Since the early years of the peace process many have engaged in and encouraged the sharing of their own personal experiences of the conflict in Northern Ireland. Ulster University has played an integral global role in peacebuilding and this archive is yet another significant achievement.